Inquire For Special Pricing, Near Disney Private Pool/Spa, Game Room, Awesome Amenities! We thank you for considering this beautiful home at Champions Gate Resort in Orlando- home to wonderful theme parks and just a short drive to the beaches! Champions Gate features the stunning world-class Oasis clubhouse equipped with a large pool, waterslide and exercise room. In this beautiful 9 bedrooms and 5- bathroom home, that sleep 24, there is plenty of space for everyone to have privacy and sleep comfortably. The bedroom configurations consist of 3 king bedrooms, 1 queen bedroom, 2 double bedrooms (one has 3 double beds) and 3 single bedrooms. 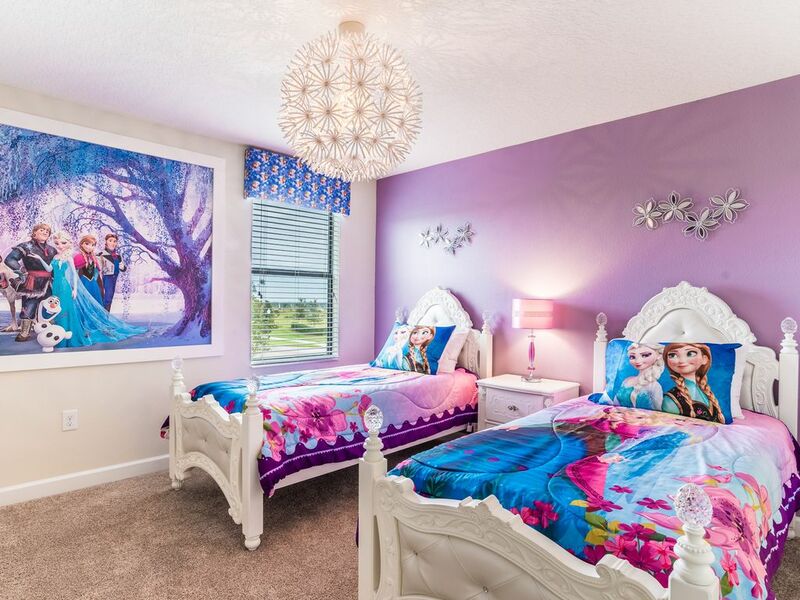 There are even 3 themed rooms, which the kids will love - a Mickey bedroom, an Avengers bedroom and a Frozen bedroom. The game room features billiards and air hockey for some friendly competition. There are great dining options are nearby or simply enjoy preparing meals in the fully furnished kitchen which are beautifully decorated and upgraded with granite countertops and stainless steel appliances. The private pool and spa has plenty of poolside furniture to provide hours of relaxation. Disney, SeaWorld, Universal and the finest in premium outlet shopping is nearby. Free WIFI and a washer and dryer are included for your convenience. This vacation will create memories to last a lifetime. Call and book your home now. We look forward to your stay with us! The house was wonderful! Please add more paper towels and trash bags. The fire alarm kept going off. The security gate line to get in was unacceptable. One evening we waited over one hour!! The system to check in rental visitors must be improved. Thank you so much for the review. We appreciate your feedback, and are always striving to give our guests the best vacations possible. To hit on the positives, I am so glad you loved the house! I will pass on the information about paper towels and toilet paper to see if we can make some changes. We normally just leave starters in each restroom to get you through the first few nights, then you replace those on your own. Once again, I will do my best to see if we can leave more. Now to the major negative. First of all, please accept my most sincere apologies. You are 100% accurate on your complaint about check in. Our company received hundreds of calls this holiday weekend about things being backed up at Champions Gate. I must emphasize they are NOT our company, but here is what we are doing. We have called the sole manager of their entire resort and stated this must change. They even tried to give us the run around, and we stated that's not acceptable. The only reason this weekend was so bad was due to Memorial Day, but it's totally unacceptable. We are making them be accountable, and get the gate check in process fixed so guests are not sitting forever waiting to get in. Thank you again for your kind review, and please come back and see us soon. Was pleased with stay. We had cheerleaders with us so sound does travel anywhere! Love the spacious layout. Thank you so much for your business, and we are so glad you loved the house! Please come back and see us very soon.